Jim began studying the violin at the age of seven, and his teachers include Elizabeth Holowell, senior lecturer in violin at the University of Auckland, and Dimitri Atanassov, former concertmaster of the Auckland Philharmonia Orchestra. He has played with many ensembles and, as a member of the Moldau Quartet, reached the semi-finals of the NZCT Chamber Music Contest. He has also been a member of the NZSO National Youth Orchestra. Jim joined the AYO in 2009, starting in the second violins. He has shown exceptional commitment to the orchestra, playing in all but one programme since then, including the 2011 tour to the Young Euro Classic Festival, and has gradually risen to the position of Concertmaster. He performed as a soloist with the orchestra in 2014, playing Bruch’s Violin Concerto, and has performed with Bach Musica, playing Bach’s Concerto for Violin and Oboe. He is a holder of an LTCL from Trinity College London and is currently studying towards a Bachelor of Engineering degree. Zosia holds an LTCL Diploma with Distinction in Performance Violin and is excited to be joining the AYO for her first time in 2018. A Suzuki student at heart, she loves performance opportunities and sharing her love of music with others. Zosia has performed as a soloist to the Governor General of New Zealand, to the St. John Ambulance Association at a formal Investiture Ceremony, at the St. Heliers Bay Festival in Auckland and is much in demand as both a soloist and ensemble musician for weddings and events. 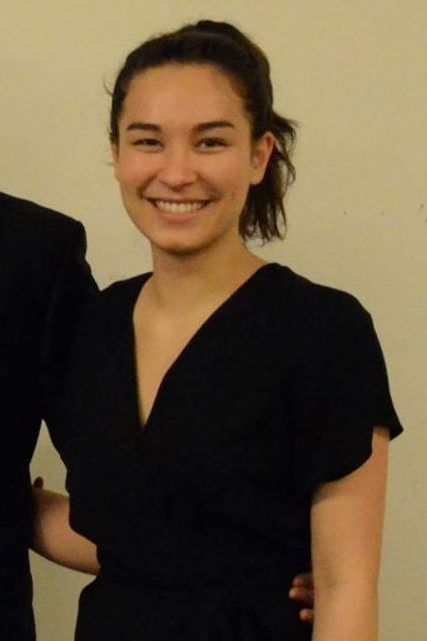 She is Concertmaster of the Baradene College Senior Orchestra, Senior Organ Scholar at Baradene College of the Sacred Heart, a Scholar of the Pettman National Junior Academy where she studies with Elizabeth Holowell, and the current Organ Scholar at Holy Trinity Cathedral in Auckland. Zosia is sought after by her peers as a sensitive piano accompanist, and also plays the Lever Harp (for fun!). As a violinist, Zosia is a regular participant in APO and NZSO opportunities, plays annually with the KBB Honours Orchestra, has played with the New Zealand Secondary Schools Symphony Orchestra in Christchurch, and has been a member of the NZSO National Youth Orchestra since 2016. In her spare time, she delights in Shakespearean acting, swimming (especially during winter), and flying gliders as a Corporal with the Air Training Corps 40 Squadron. When she grows up, she will probably be an astronaut. Kauri started learning the violin at the age of three, and attained her ATCL Diploma in Violin with distinction in 2015. Outside of AYO, you can find Kauri on campus studying very intensely towards her Biomedical Engineering degree, boogeying on the d-floor at your next Auckland City Scoundrels gig, petting non-yappy dogs, or eating carbs. Walter is currently a Year 13 School Prefect at Macleans College. Walter began learning the violin at the age of five and is studying toward a dipABRSM with Olga Vorontsova. 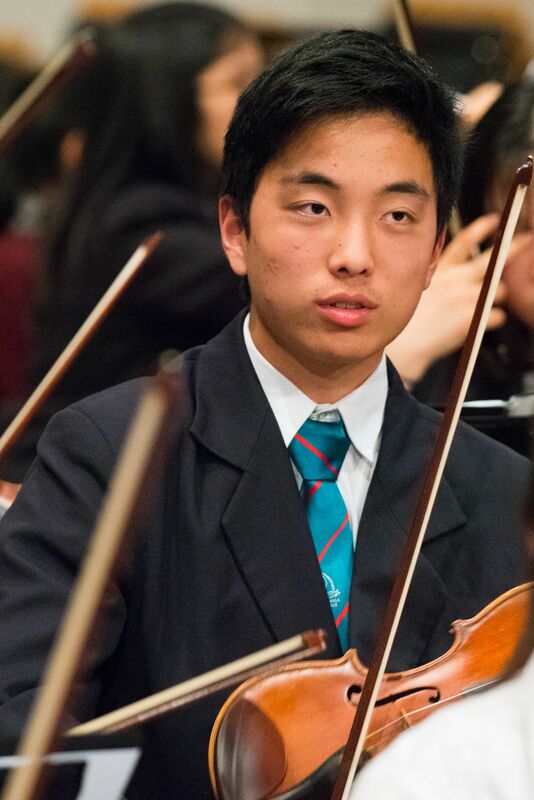 Having passed Grade 8, Walter is currently serving as the Principal Violinist of the Macleans College Symphony Orchestra and Chamber Orchestra. He was also a member of two chamber groups that were semifinalists in the Auckland District round of the NZCT National Chamber Contest. He was the winner of the Senior String Championship at the South Auckland Performing Arts Festival in 2016 and the Junior Solo Competition at Macleans College in 2013. Walter is also employed by the Howick School of Music as an orchestral assistant and administrator. 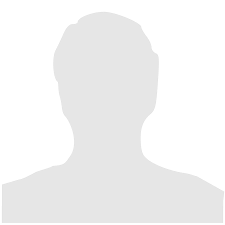 Michael is currently an engineering student at the University of Auckland. He began learning the violin at the age of 7 and has completed his ATCL Diploma. 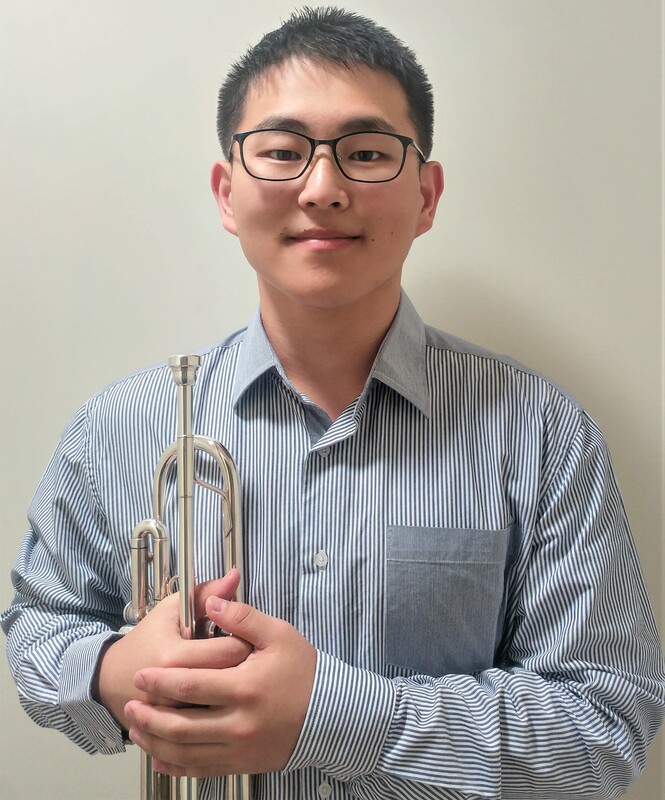 Michael joined Auckland Youth Orchestra in 2018. He is also currently in the first violin section of the Manukau Symphony Orchestra, and previously Macleans Symphony Orchestra and Macleans Chamber Orchestra. 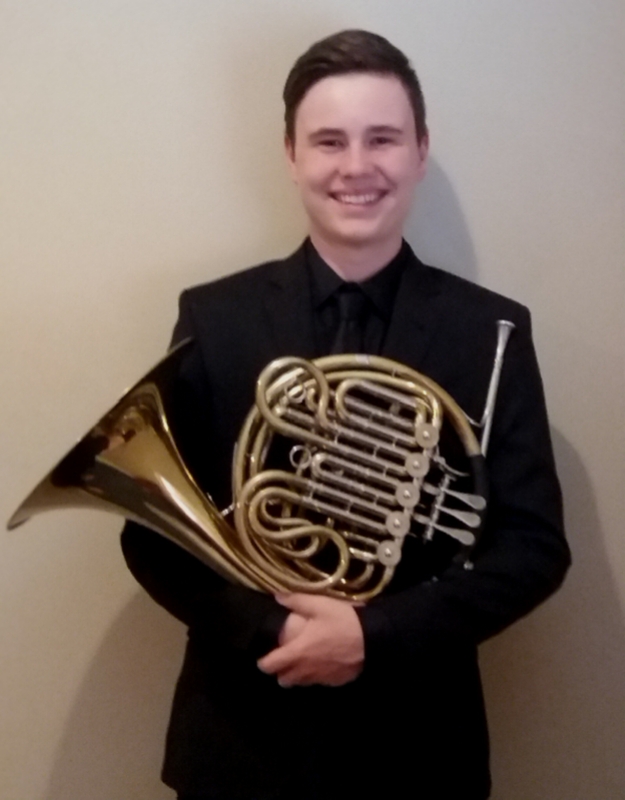 Michael was a member of many chamber groups that competed in the NZCT National Chamber Contest and the winner of Manukau Symphony Orchestra scholarships in 2016. Mana is a 16 year old violinist who attends Massey High School in West Auckland. She started learning the violin at age 7 through the Suzuki method with Simon Griffiths. This is Mana‘s 4th year playing in the AYO. Mana has been an award winner in the AYO Soloist Competition for two consecutive years:- Most Promising (2017) and the Gem Section winner (2018). 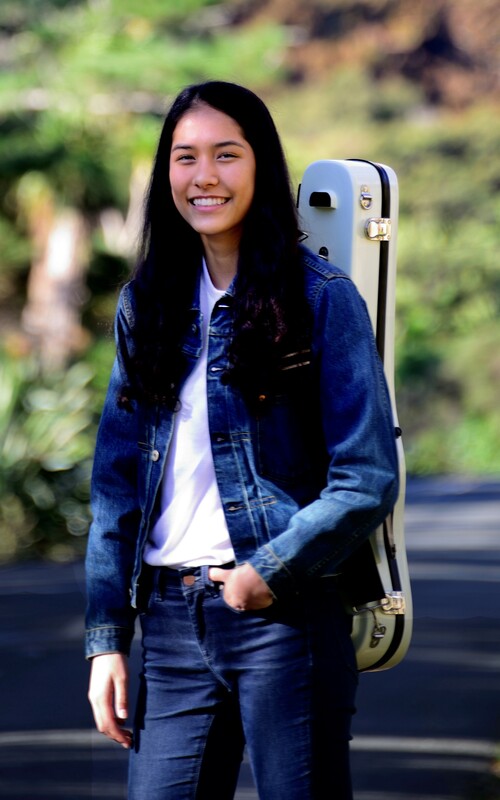 Before she joined the AYO, Mana was in the North Shore Junior Orchestra, and the APPA Festival Orchestra. In 2015, she appeared as a featured soloist playing the Bach Double Violin Concerto with the APPA Festival Orchestra. This year, Mana will be a part of the NZSSSO. In the near future, Mana is determined to study Music at university and perhaps do a conjoint degree with Health Science. Mana’s hobbies other than music include travelling, and visiting various cafes around Auckland. Bryan is a Year 13 Westlake Boys High School student. He has learnt both piano and violin for 10 years, achieving grade 8 with Distinction in 2013. He enjoys playing in musical groups very much as well as outdoor activities such as hiking with friends and family. Bryan looks forward to continuing his music studies at university. Angeline Xiao is a Year 12 student at Epsom Girls’ Grammar School. She has played the violin for 8 years, the piano for 10 years and recently took up the bassoon. 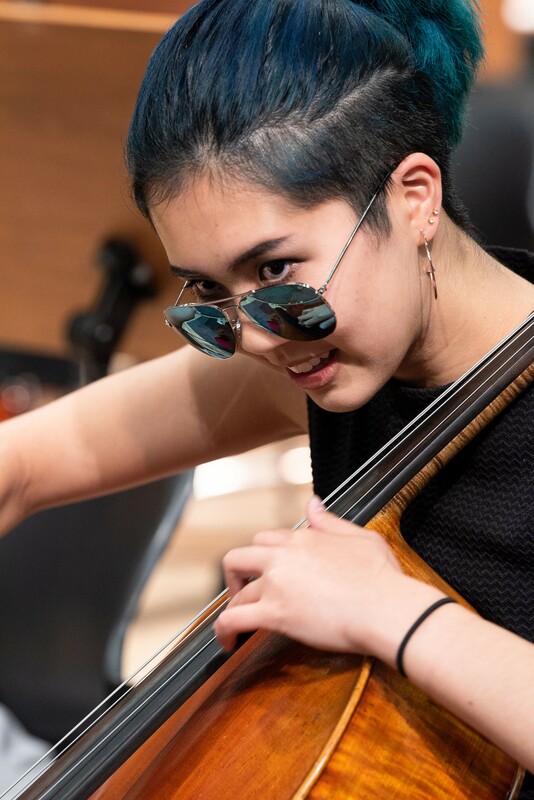 Angeline has played in AYO since 2017, and also played in NYO 2017-2018. She is committed to a variety of music groups at school, including the orchestras and concert bands. She is currently the associate concertmaster of the EGGS Symphonia. 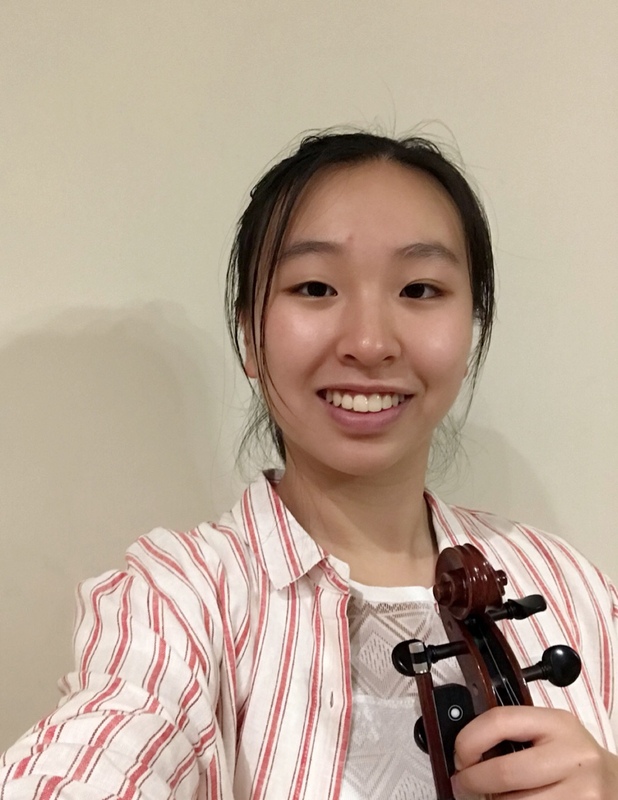 Angeline has won the odd competition or two, and has also been a member of a chamber group with fellow AYOers Bryan Lin & Xutong Wang, which proceeded to the semifinals of the NZCT Chamber Contest. In her spare time, Angeline enjoys eating good food, going to the beach, and wants to travel all around the world. Amber is a tertiary student about to embark on her first year at Animation College. She is a Suzuki violin student and has been playing since the age of four and a half. Her first orchestral experience was spending two years with the Aotea Sinfonietta during primary school. 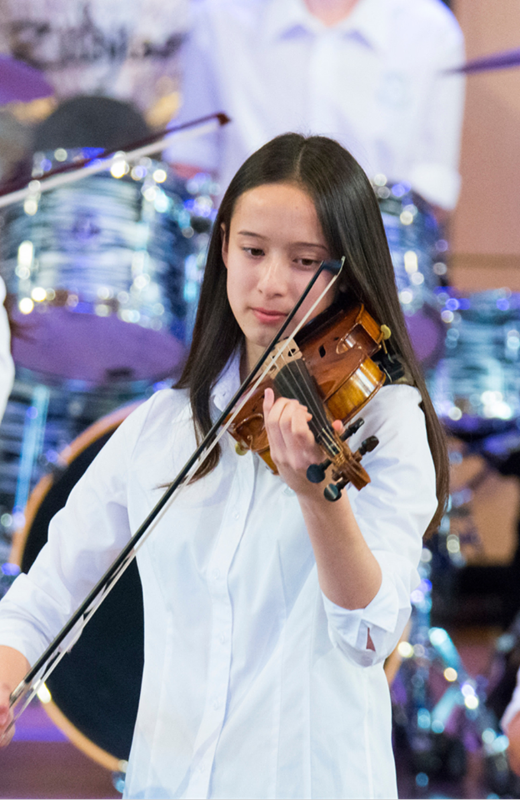 Since then she has played in both her intermediate and high school orchestras and chamber orchestras as a first violin, and a variety of ensembles, including the 2015 KBB Honours Orchestra. Amber has also sung in the school choir and had two of her compositions performed by the school orchestra. In 2016 she travelled to Switzerland to the Suzuki music conference to play with other students from all around the world. Amber’s other hobbies include archery on the weekends, fantasy writing and video gaming. She also stays active as an online artist on DeviantArt under the name ShoutFinder where she creates fan art and commissioned pieces. Jasper has been playing the violin for 7 years. He has passed ABRSM Grade 8 and hols a Trinity ACTL violin diploma. 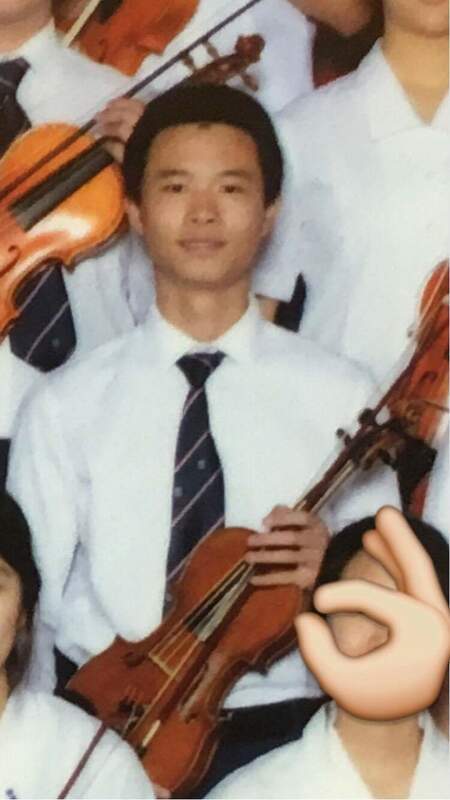 He has attained 2nd place in the Violin section in the West Auckland Performing Arts Conpetitions and 3rd place in the String solo section of the North Shore Performing Arts Competition. He also plays with the Mt Roskill Grammar school String Orchestra. 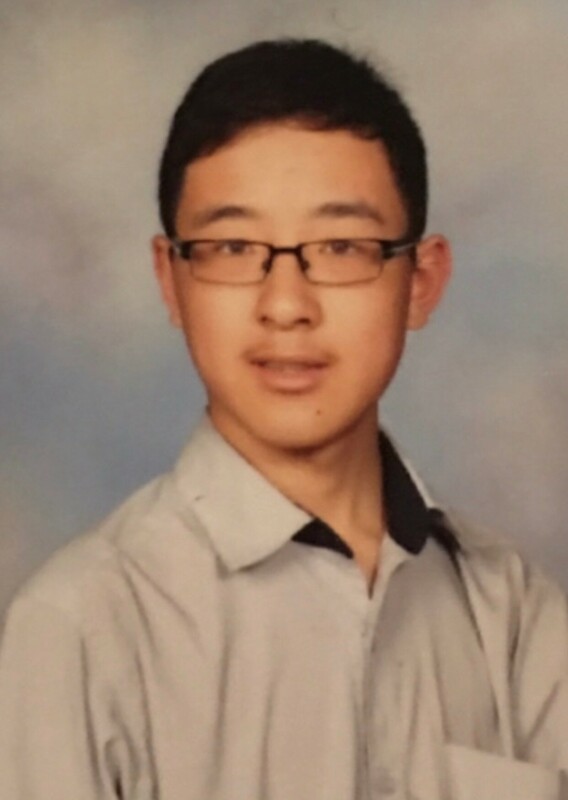 Darren is a Year 11 student at Massey High School. He started learning the violin at age of 10. Prior that he learnt keyboard for 4 years. At school, he plays in the orchestra, chamber orchestra, and concert band (trumpet). He also plays in Vivaldi Academy chamber orchestra. This is Darren’s first year in AYO and he looks forward to meeting new people, improving his skills and playing great music! Outside music, he enjoys making miniature models and reading. Originally from the sunny Hawke’s Bay, Nesta is joining AYO for the first time in 2019. She is in her first year at the University of Auckland studying biomedical sciences. Nesta started playing the violin at the age of 5 through the Suzuki method and now learns with Gregory Squire in Wellington via regular Skype lessons. 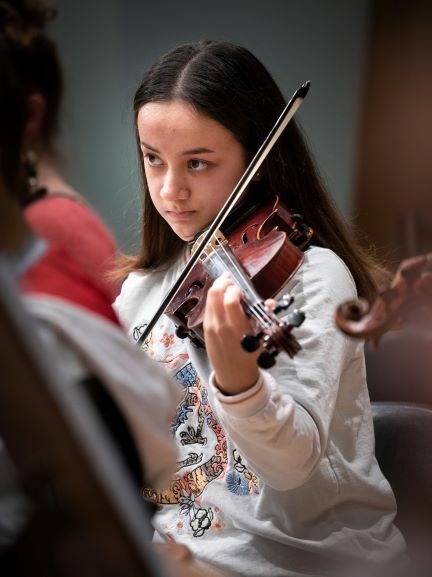 She achieved Grade 8 violin with distinction in 2017 and was a member of the Hawke’s Bay Youth Orchestra from 2013 to 2018, including being the leader in 2017 and 2018. Last year she also played in NZSSSO. As well as playing the violin, Nesta likes to take photos, read and explore new places. Joseph began learning the violin at the age of four, thinking it was the guitar. By seven, he realised the two were different instruments, and though slightly disappointed, continued learning the violin. 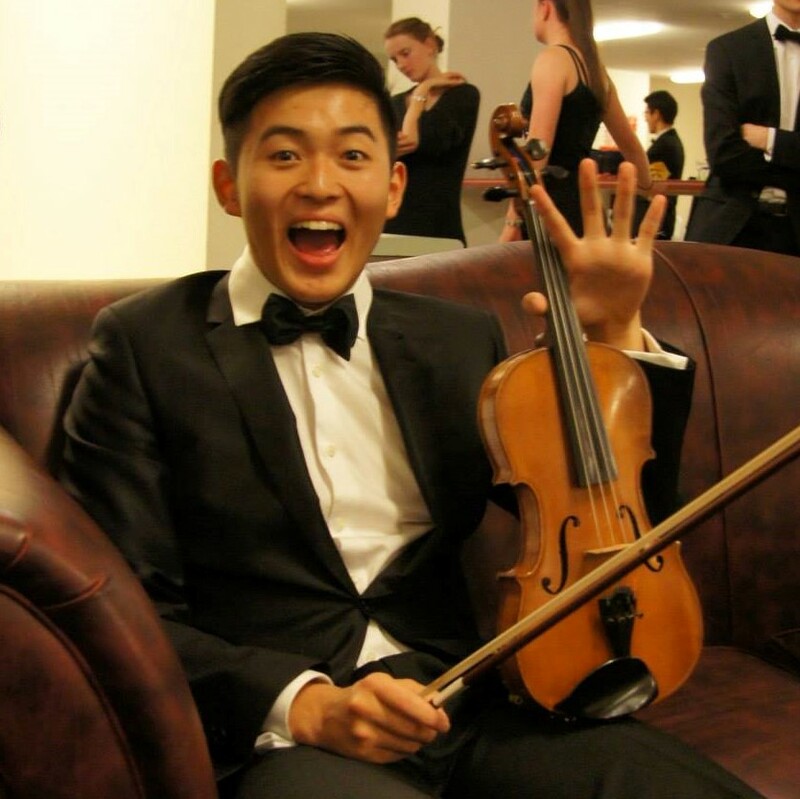 He has since achieved his LRSM (Violin Performance) in 2012 and been incredibly privileged to play in a wide range of chamber and orchestral ensembles such as: the Doremi Dudes, the amorous Gramareu, the Devonport Chamber Orchestra, and the Auckland Youth Orchestra. With music deeply ingrained in his upbringing, he lives his world through the scope of music and actively pursues an amateur full-time immersion in enchanting audio landscapes of all kinds. On the side of his wild musical adventures, he is currently a postgraduate student in Biomedical Science at the University of Auckland where he intends to try to uncover mysteries within the field of neuroscience. 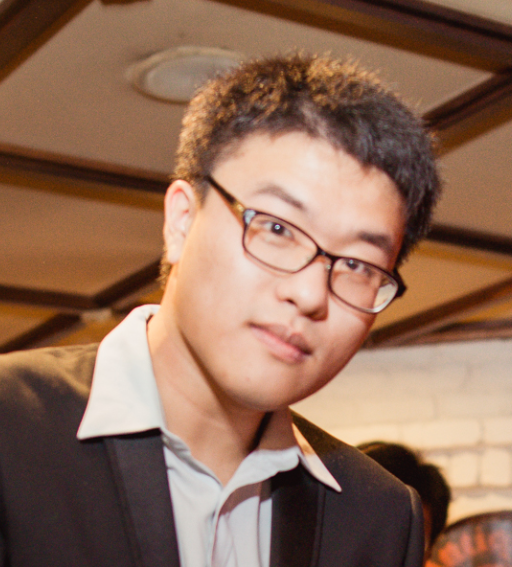 Kenny Li is a student at the University of Auckland currently studying Computer Systems Engineering. He started learning the violin at the age of 10 and has achieved ATCL. Kenny is also competent at the piano and trombone. Outside of music, Kenny plays a variety of sports and enjoys cooking. Gemma is an over-enthusiastic 20 year old in her third year of an Engineering Science degree at the University of Auckland. She chose this specialisation because it involves lots of maths and allows her to stay blessedly far away from building hot dog stick bridges and learning about concrete. To balance the countless hours she spends staring at broken code and differential equations, Gemma is back for her third year in AYO, and is again one of the orchestra’s player representatives on AYO’s Executive Committee. Gemma is also a member of the Auckland Youth Choir, a volunteer with the Society of Saint Vincent de Paul, and an avid reader and talker. Erin has always had an innate love for music. She discovered her passion for the violin three years ago, and has ardently pursued every opportunity to play ever since. At 15 years, Erin is a Year 11 student at St. Mary’s College where she plays the violin for the St. Mary’s Senior Orchestra and the St. Mary’s Chamber Orchestra. Erin is also a soprano and is part of the St. Mary’s Senior Choir and the St. Mary’s Chamber Choir. She also enjoys playing the harp. Apart from music, Erin dabbles in digital arts and is keenly interested in science. Sadie has been involved with music from a very young age, starting violin lessons with her Suzuki teacher grandmother. Being surrounded by a very musical family, she has developed an affection for music, and in particular the violin. 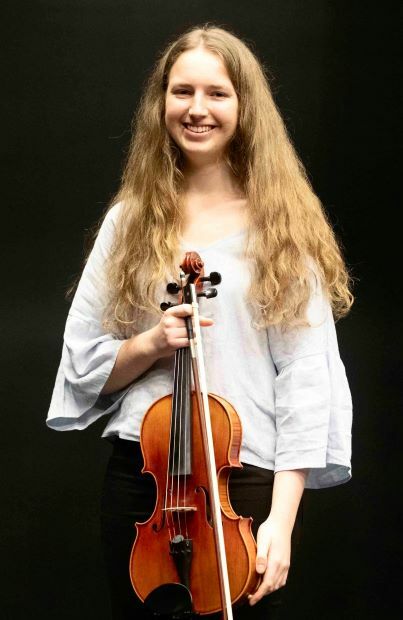 Sadie is currently in Year 11 at St Mary’s College, where she enjoys her role as a first violinist in the senior orchestra, and is also a member of the chamber orchestra. This will be her first year in AYO and she is looking forward to the challenges and learnings to come in 2019. Sadie’s interests are sciences and digital design, she loves to travel and is an artist in her spare time. 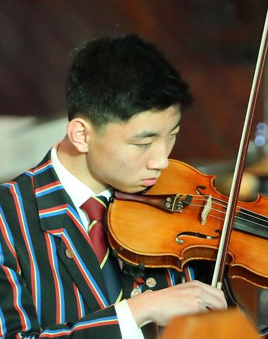 Martin Qiang is a Year 13 student from Pakuranga College and has played violin for 9 years, passing Grade 8 with Distinction. He also plays the piano and is studying towards his diploma. Martin is currently Concertmaster his of his school’s orchestra, and has been Concertmaster of the Wairua Youth Orchestra, as well as violinist and pianist in various musicals in and out of school. He has won first place in his school’s senior instrumental solo competition, as well as in various other competitions out of school. This is Martin’s first year in AYO, and he is really looking forward to meeting new people, improving on violin, and making amazing music with others! Emily is currently a Year 13 student at Avondale College. She has been playing violin for 10 years via the Suzuki method and is fully involved in her school’s music co-curricular groups; she is the Associate Principal Violinist of the Avondale College Symphony Orchestra, Principal Violinist in the String Ensemble, and performs as a solo violinist in the annual talent quest. 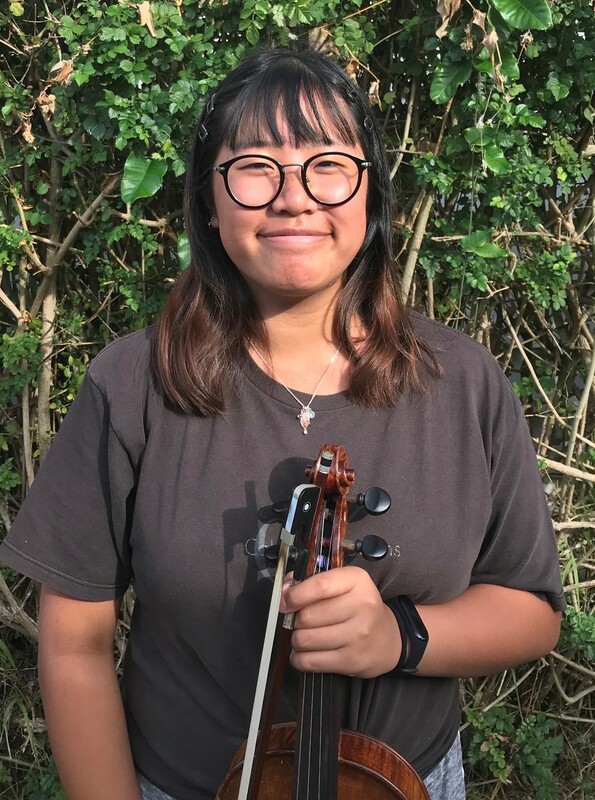 She has also been a finalist in the annual Auckland secondary schools music and dance competition, Stand Up Stand Out, which is delivered by the Auckland Council as part of a regional arts and culture program for youth, performing as a solo violinist using a loop pedal. Emily also enjoys contemporary dance and lacrosse, and is interested in science and psychology. Bethany is a Year 11 student at St Mary’s College, Ponsonby, where she plays 1st Violin in both senior orchestra and senior chamber orchestra. She has been playing violin since she was 7 and has recently achieved Distinction at ABRSM Grade 8. In addition to her musical endeavours, Bethany is actively involved in swimming, climbing and orienteering. 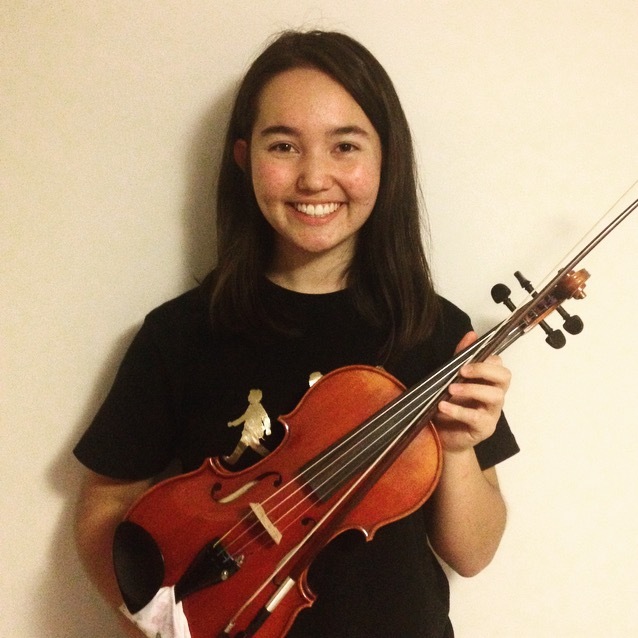 Kelly began studying violin at the age of 9, and has achieved Grade 8. She is a recent graduate with an Engineering Science degree from the University of Auckland. To fuel her quarter life crisis travel plans, Kelly now works as an analyst with Air New Zealand. Outside of work and rehearsals, you can find Kelly jamming to the sweet brass tunes of Auckland City Scoundrels or looking for cats for her #CatsofPonsonby series, which is growing in popularity by the day. Sungju is a Year 12 student at Massey High School. He began playing the violin at the age of 10. He was learning the violin quickly and discovered a passion for it. 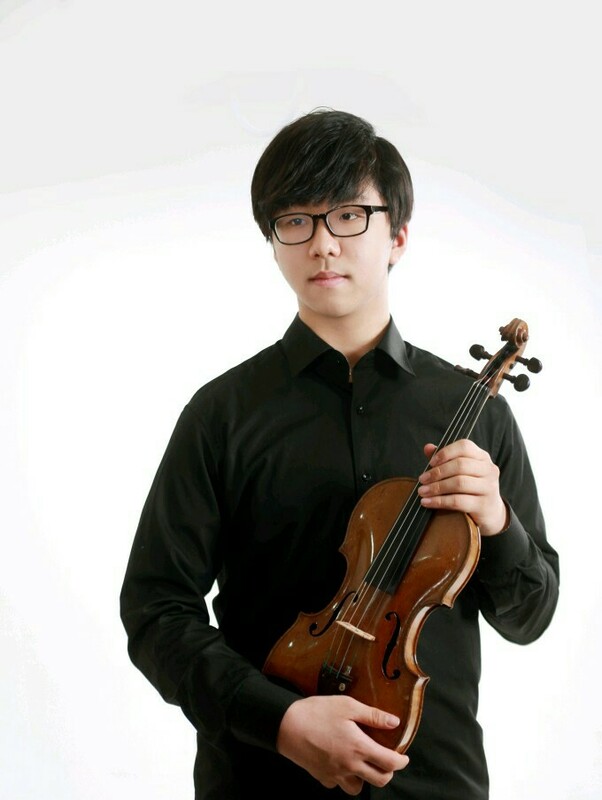 He is Gold medal winner of the “National Music Competition” supported by St. Petersburg Conservatory in Korea. He was also a Bronze medal winner of the “National Competition” held by Incheon Music Association in Korea. This is Sungju’s first year at AYO. He is very happy to meet lots of new people and to improve his skills. Outside of music, Sungju is a cheerful young man who loves cooking. 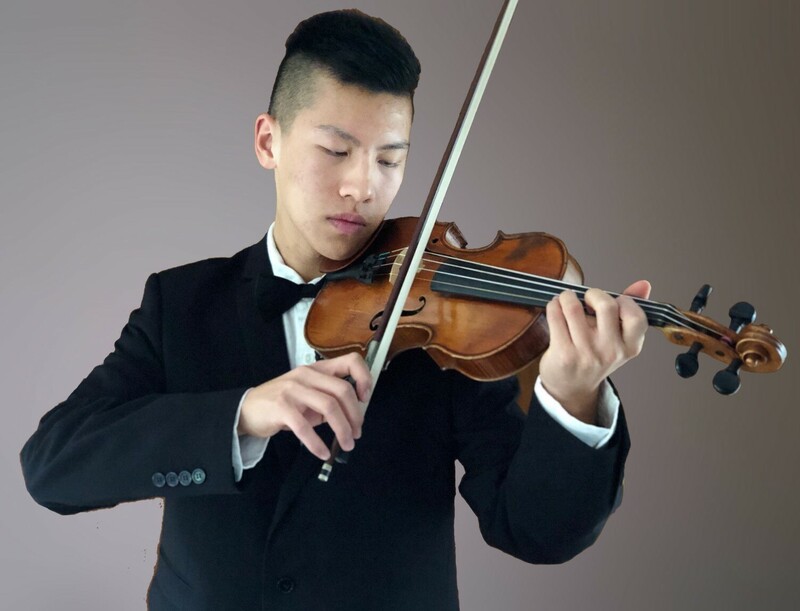 John is a 16 year old violinist currently studying at King’s College. He started playing violin at the age of 5 with Boris Kipnis and obtained his Grade 8 certificate in 2016 as well as an ATCL with Distinction in piano. He joined AYO in 2017 and travelled with the orchestra on their Europe tour in 2018. John has competed in numerous competitions such as the SAPACS, Lewis Eady, and the NSPAS, as well as participating in chamber music. He is involved in both the Symphony Orchestra and the String Orchestra at King’s, which compete every year at the annual KBB festival. John’s other hobbies include art, fountain pens and photography though not particularly brilliant at any of them. Brahms is pretty nice…. 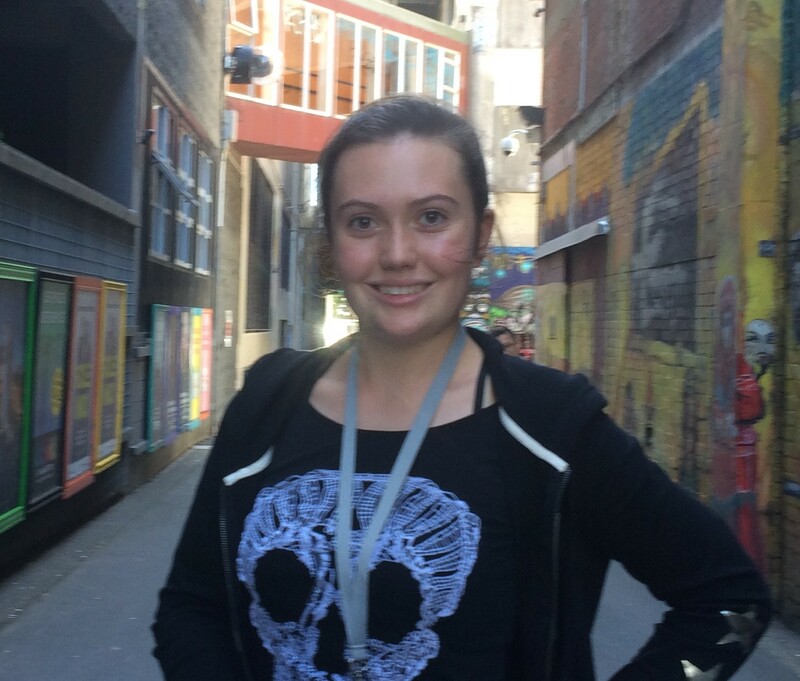 Athena is a Year 13 student at Botany Downs Secondary College. She started learning the violin at the age of 4 and has achieved ABRSM Grade 8. At school she is a member of the orchestra as well as the jazz band. She has her own piano quartet and contemporary band as well. 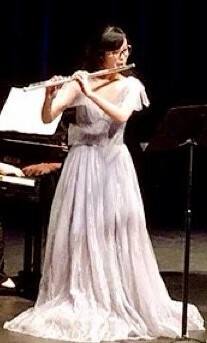 Before joining the AYO, she was part of the Metropolitan Youth Orchestra in Hong Kong. She is also a pianist and a trombonist, and currently playing in Auckland Winds Orchestra. This is Athena’s first year in AYO. She is very excited to meet other talented musicians and to improve her musicianship as well as her skills. 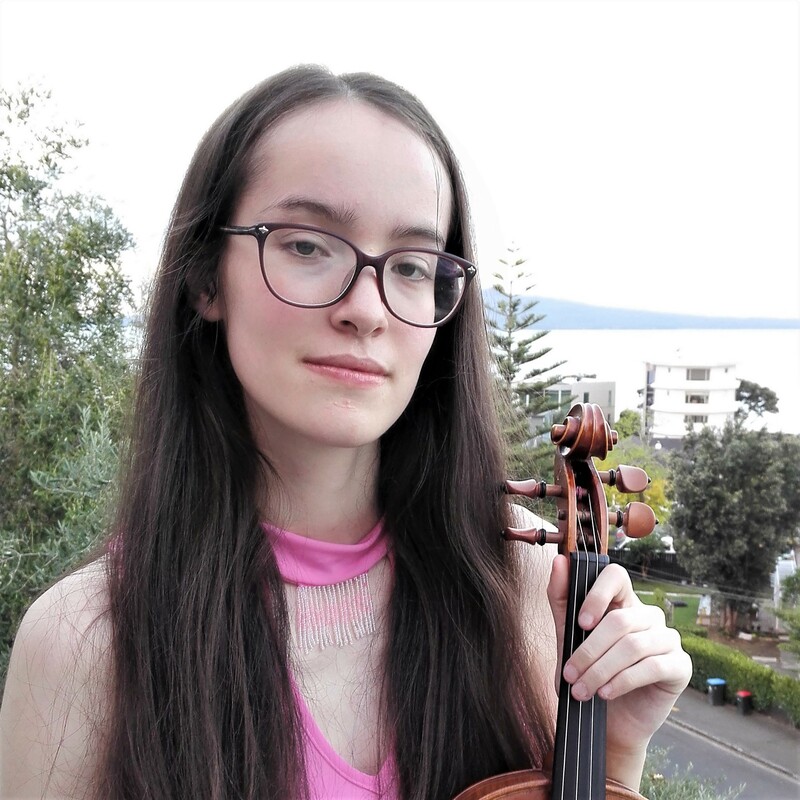 Jessie is in her second year at the University of Auckland, where she studies a BA/BMus conjoint degree in psychology and classical performance viola with Stephen Larsen. Originally from Christchurch, Jessie joined AYO in mid-2018. She has played in the NZSO National Youth Orchestra for the 2017-2018 seasons, in the NZSQ Adam Chamber Music summer school, and in the finals of the NZCT Chamber Music Contest. When not practising/studying/sleeping, Jessie enjoys finding new music to listen to, running in the Auckland Domain, and reading books that make her feel (falsely) intellectual. Jasper is a Year 12 student at St Mary’s College. She has been playing the violin since the age of 6 and has been playing the viola since Year 8. Her experience includes being a part of the APPA for 5 years, attending the APO workshop for 5 years, Aotea Youth Symphony for 2 years and St Mary’s College orchestras. She also participated at the 2014 WAPAC and SAPAC and received an award for being the Most Promising Junior String Player. Jasper was accepted into the NZSO Mentoring Programme in 2017 and was mentored by violist Peter Barber. Jasper enjoys skateboarding and skiing in her free time. She also loves going out with her family and friends. Isaiah originally started the violin at age 6 but picked up the viola three years ago. He is 18 years old and is taking a gap year to save for university next year, where he hopes to study bio-medical sciences as a pathway to medicine. 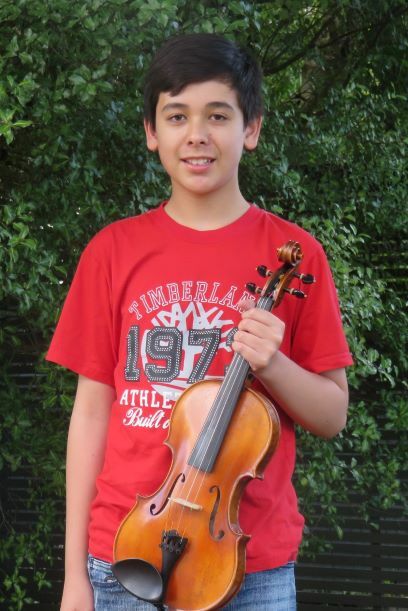 Isaiah has been involved with Whangarei Youth Music for 5 years where he has been a sectional leader for both his string group and orchestra – principal 2nd violinist for two years and then principal violist for the following 3 years. 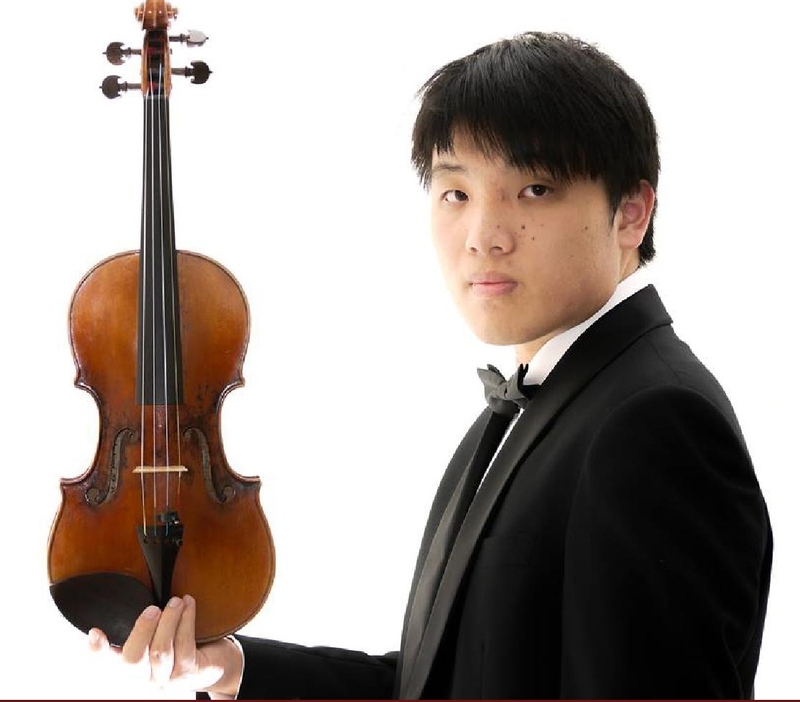 He won second place in the Northland Performing Arts Competition in 2016 and, in 2018, the orchestra and string group he played with at WYM earned gold awards at the Rhapsody Rotorua music festival. Also in 2018 he won the New Zealand Secondary Schools Chamber Music Contest, playing in the Te Ahi Kaa ensemble. Isaiah is currently working towards LTCL on viola. Aside from music, Isaiah enjoys partying, sports and gaming. Jennifer is in her final year at Epsom Girls Grammar School. She played violin briefly when she was younger and decided to take up the viola in Year 8. As well as playing the viola, Jennifer also enjoys playing the piano, flute and piccolo. At school, she plays in the orchestra, chamber orchestra, and also sings in the choir. 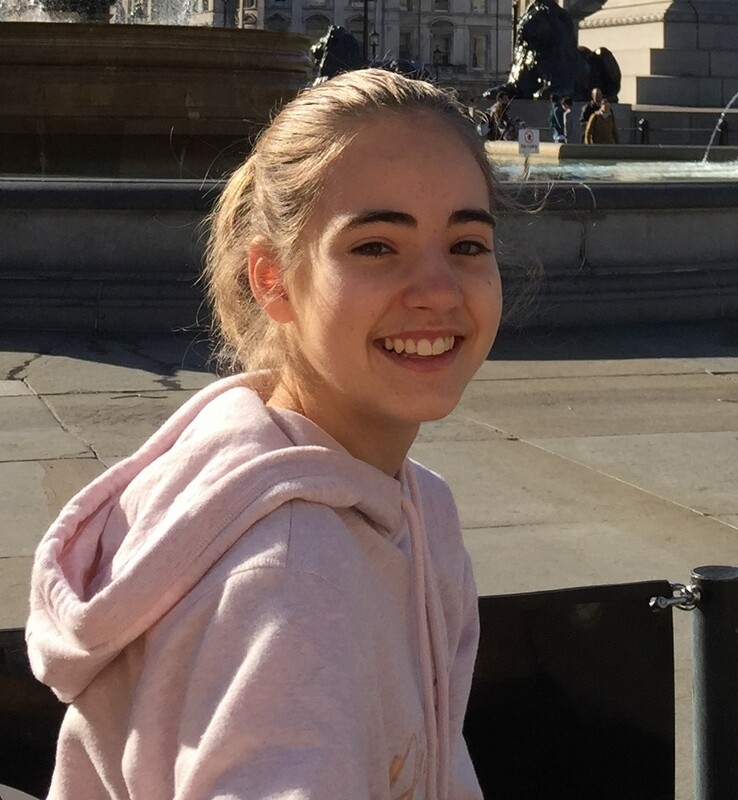 This is Jennifer’s second year in AYO, and she is looking forward to making more friends, improving her viola skills and playing great music! Outside of music, Jennifer enjoys playing and umpiring badminton, eating good food, and spending time with friends and family. John is new to AYO in 2019 and is looking forward to the musical opportunity and community it will provide. He is in his second year at the University of Auckland studying statistics and music composition degrees. He has played viola since 2013 and piano since 2005. Over the years John has enjoyed being a part of several orchestras, chamber groups and bands, including the Aotea Youth Symphony and the Dalewool Youth Brass Band. He has played several other instruments including violin and percussion. John also enjoys photography, tramping in the New Zealand outdoors and spending time with friends. Gabby is a first year Bachelor of Engineering student hailing from Wellington, where she was playing for Wellington Youth Orchestra. She holds an ATCL with distinction on the piano and a DipABRSM on the cello. Gabby was a cellist in the New Zealand Secondary Schools Symphony Orchestra for four years, and was the associate principal cellist in her last year. In her free time Gabby plays the saxophone (very badly) and bakes chocolate chip cookies (very well). 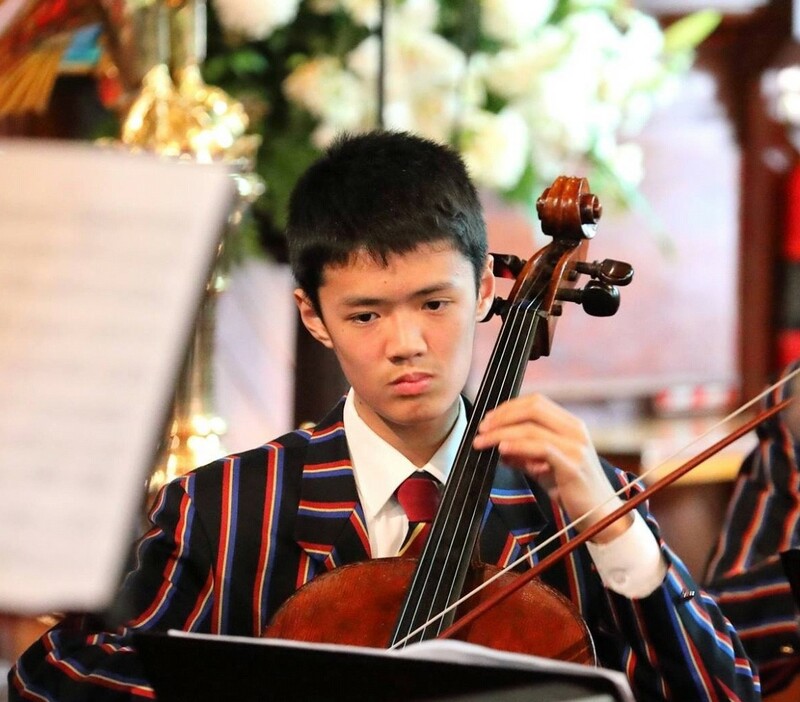 Marcus Ho, aged 15, is in his third year at Kings College and has been learning cello for 8 years, currently learning under Edith Salzmann, attaining his Grade 8 certificate in 2015. He has also played the trombone for 5 years and enjoys playing jazz as a change of pace. 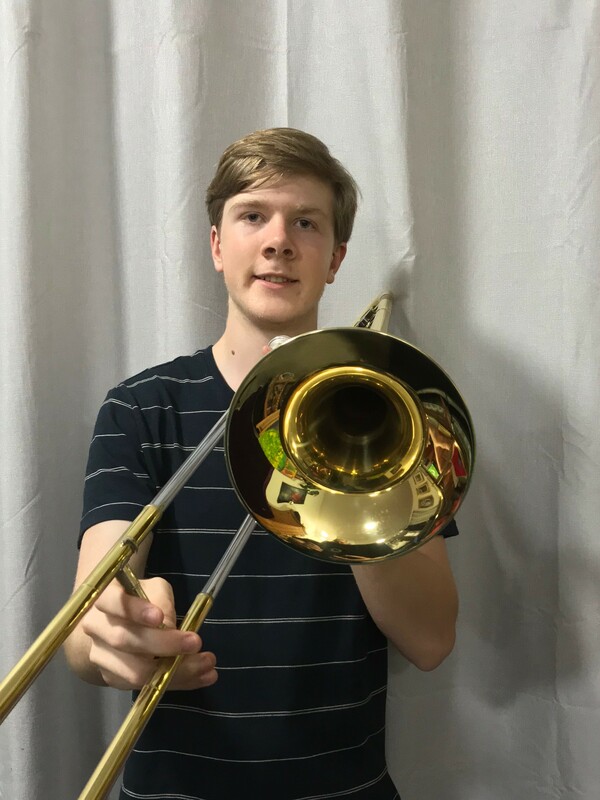 Marcus is involved with the Pettman National Junior Academy and greatly enjoys the many opportunities he is given to play music with others both in and outside of school in the various orchestras, bands and chamber groups. He was awarded junior musician of the year at Kings College in 2017 and the John Philip Sousa award for jazz. He also participated in the Akaroa Music Festival and is looking forward to his second year in AYO. When he has spare time, Marcus enjoys listening to music, playing table tennis and gaming. In her second week of Year 9, Alicia showed up at her school music office asking for a cello scholarship. Then, after waiting a year for a place to open up, she found herself in love with the bass. Since then, she’s reached an advanced level on the instrument, and received a number of opportunities, including playing with the KBB Honours Orchestra, and travelling to the Pacific Basin Music Festival in Hawaii with the Rangitoto Orchestra and Chamber Orchestra in 2016. 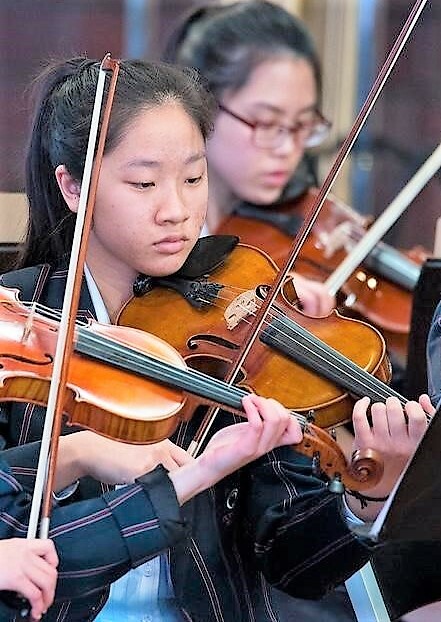 In 2018, she received a Rangitoto College Arts Award for outstanding service to orchestra. This year, Alicia will be starting a Bachelor of Music degree (pop performance), and is excited to be joining AYO for the first time. This is 17-year-old Jacob’s second year playing with AYO. 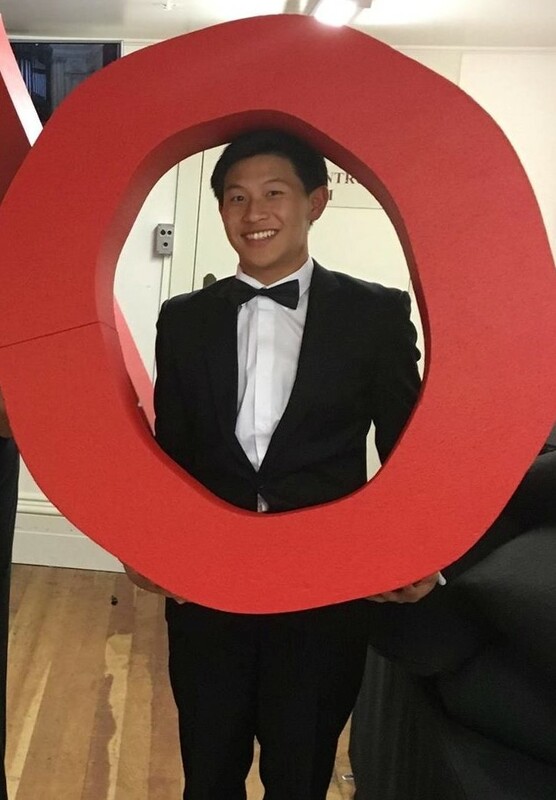 He is an APO Young Achiever as well as NZSO Mentoring recipient for 2019. 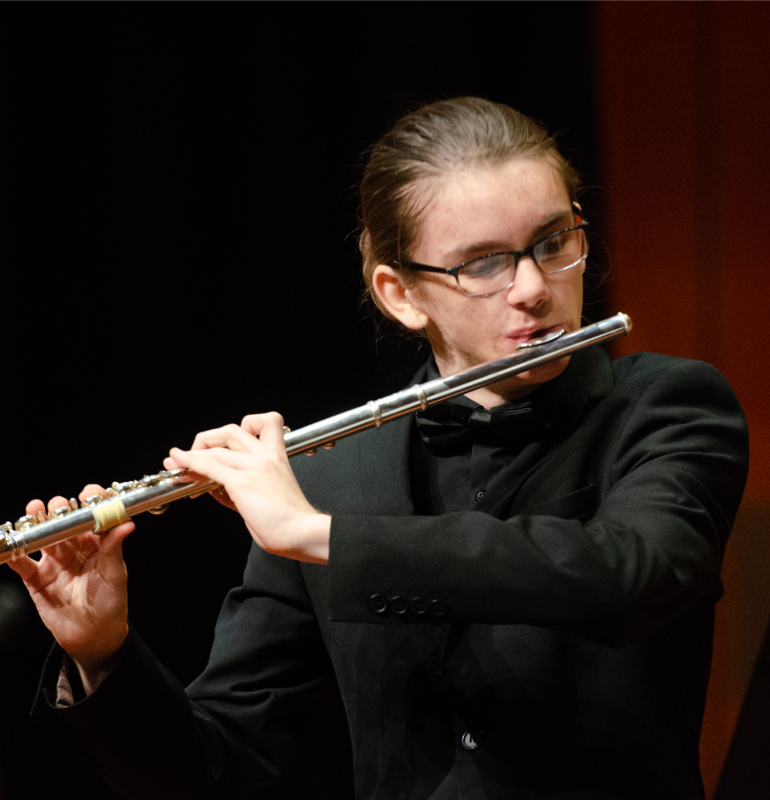 In 2018 Jacob won the AYO Soloist Competition with his performance of Mouquet’s La Flute De Pan, which he plays in the May concert series. In 2018 he was a Chamber Music New Zealand National Finalist winning a Joan Kerr Gold Award with his chamber group “Orbit”. Jacob has played the flute for 9 years. His teacher is Melanie Lançon (APO) and his previous teachers include Eric Lamb, Catherine Bowie and Raewyn Donaldson. He has received additional individual lessons with Bridget Douglas (NZSO) and Kathryn Moorhead (APO). He achieved distinction for ABRSM Grade 8 flute in 2015. Jacob was a Pettman National Junior Academy of Music Scholarship recipient from 2016-2018. Jacob attended masterclasses at the 2016 NZ Flute Fest with Uwe Grodd, where he also performed as a soloist. He attended the Akaroa music festival in 2017, placing 2nd in the solo competition for open instrumentalists. Jacob was section leader in both the Westlake Symphony Orchestra and Westlake Concert Band during his time at Westlake Boys High School. He has played in the APPA Festival Orchestra and APO Summer School Orchestra for two years. In 2014 he won the top prize in the APPA Knights Templar Competition culminating in a solo performance of Poulenc in the Auckland Town Hall. 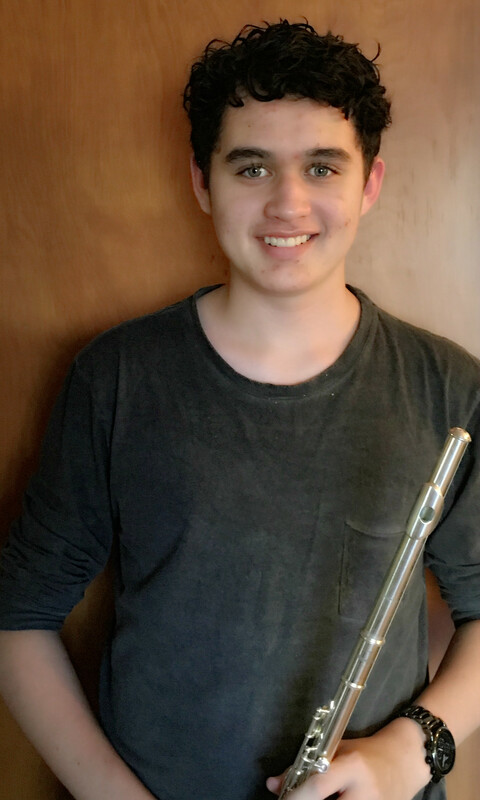 Jacob hopes to become a professional flutist in the future, travelling around the world performing solos, doing chamber music and entering competitions. 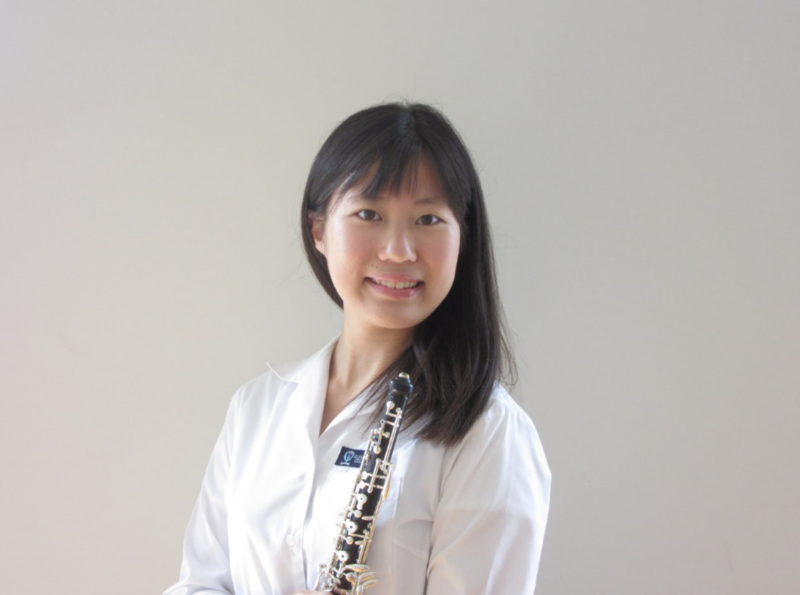 Anna is a 1st year Flute student at the University of Auckland. She has been playing the flute for 12 years and has obtained her Grade 10 certificate from the grading committee of China Conservatory at age 10. Anna was a scholar of the Pettman National Junior Academy of Music for 4 years. During her time at Epsom Girls Grammar School, she was the winner of the school competition (instrumental section) for 3 consecutive years. 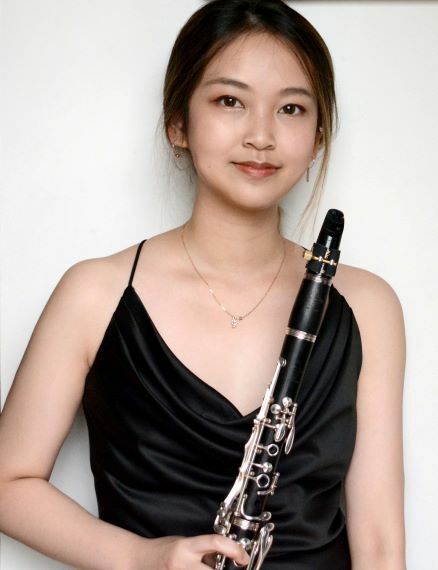 She was also actively involved in the NZCT Chamber Music Contest, with her groups getting into the Northern Regional Final in 2016, the Auckland Final in 2014, and the Auckland Semi-Final in 2017. 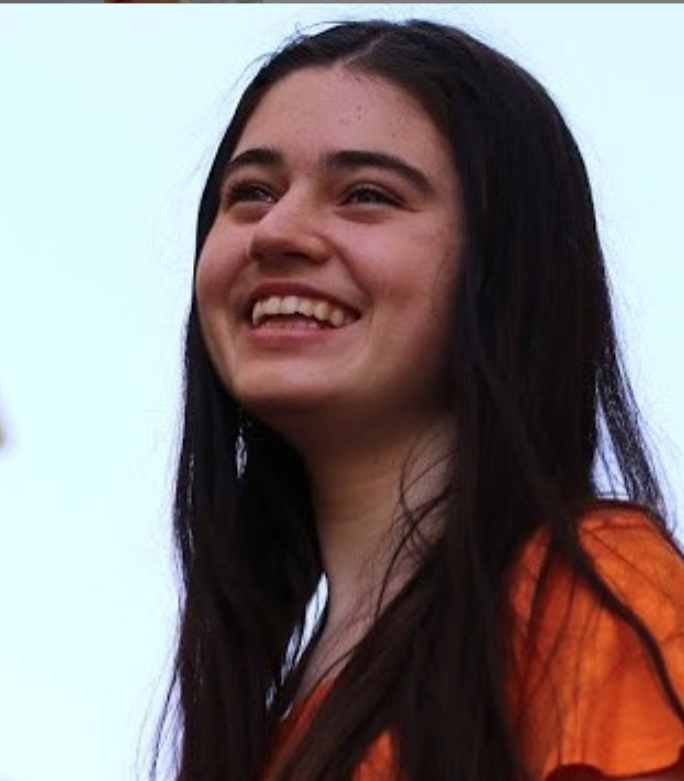 Anna has been a member of AYO since 2017 and she is looking forward to another amazing year of music making! Micah is a Year 11 Student at Liston College and has been playing the flute for 8 years. Micah loves to perform in orchestras as well as chamber groups and concert bands. He had the privilege of being in the award-winning West City Concert Band for 2 years which provided him with great experience in music-making with adults. He went to France with the Aotea Youth Orchestra in 2016 and absolutely loved it. Micah enjoys being able to share the music passion with others and can’t wait to perform with AYO this year. Akari is originally from Japan but has lived in Auckland for 4 years. She is in her final year at Glendowie College. She has played the oboe for 4 years. Akari’s passion for the oboe is because she loves the sound of it. She also plays in the Aotea Youth Symphony and the Auckland Wind Orchestra and played in the NZSSO in Christchurch this year. Last year she played in two chamber groups. This year Akari is part of the NZSO Mentoring Programme. She plans to study oboe and music at university next year and hopes this will lead to a musical career. A clarinettist, pianist and composer, Kiara is in her second year at The University of Auckland, majoring in music composition. She studies clarinet and piano under Rowan Meade and Bryan Sayer respectively and is also a member of the university’s Concert Band. Kiara was awarded the Junior Bishop Music Prize for composition in 2018, and in 2017 she won the Nadine Levitt Scholarship as well as her school music competition (piano section) as a soloist. She was a scholar of the Pettman National Junior Academy of Music in 2016 and 2017 and has been involved in chamber and jazz ensembles. Kiara is excited to be part of the AYO community. 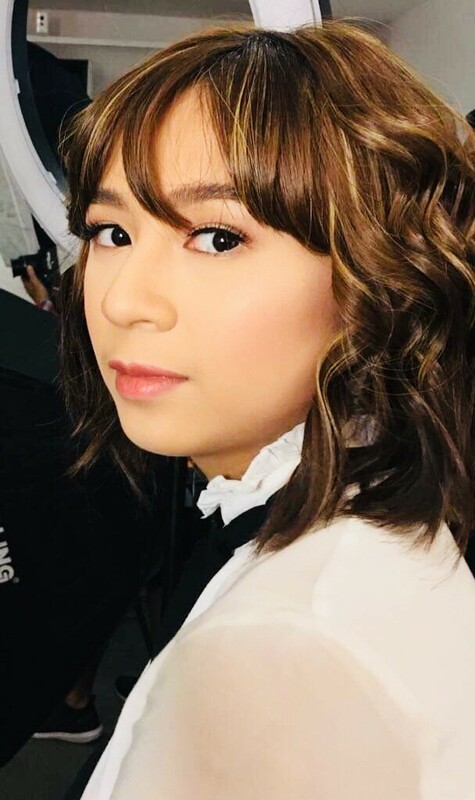 She will be studying orchestrations and conducting courses in 2019 to further her knowledge in ensemble writings. She believes that one day her works will be performed by the greatest musicians and orchestras in the world. Keep an eye out on her upcoming work for solo piano. 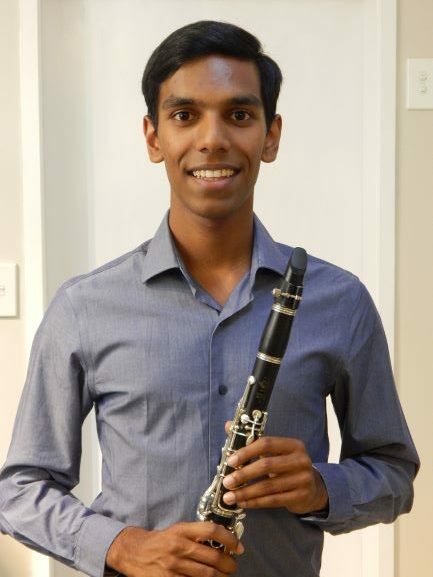 Gautam has been playing Clarinet since the age of 9 and has completed Grade 8 with Distinction. He was principle clarinet of Westlake Symphony Orchestra and has taken part in many award-winning music groups, including Westlake Concert Band and choirs. Gautam is currently studying a Bachelor of Medicine and Surgery at the University of Auckland. He is very enthusiastic about music and passionate about the outdoors, often going hiking with family and friends. Clara started learning the clarinet at the age of 9 and since then has been a part of numerous music groups including the award winning Westlake Concert Band. Her passion for music was developed during high school and she was the principal clarinettist in the KBB Honours Orchestra. This is Clara’s first year in AYO. 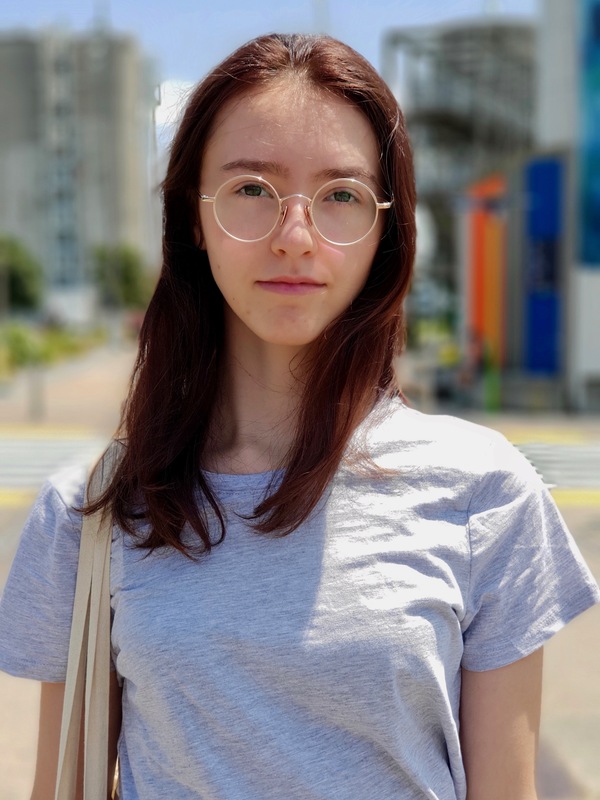 Clara currently studies as an Optometry undergraduate at the University of Auckland and enjoys tutoring music at a local intermediate school each week. 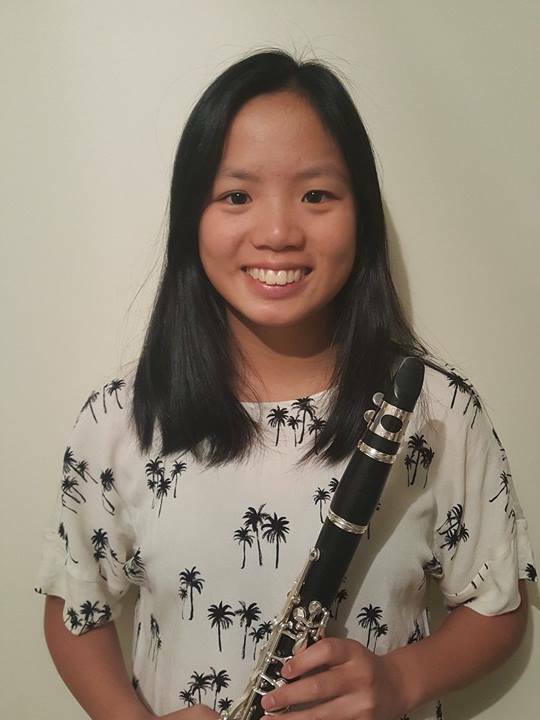 Monica has been playing the bassoon since she was thirteen years old and is in her second year of studying towards a Bachelor of Music at the University of Auckland. 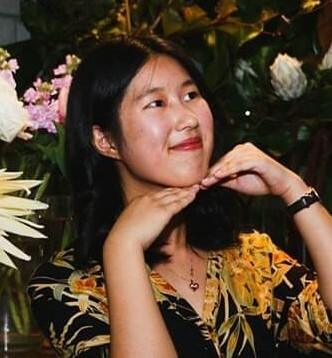 This is her second year with AYO, and she is also involved with other music groups such as the University of Auckland Symphony Orchestra and Fidelio Wind Octet. She has played with many groups over the years in high school, university and the community, and this experience helped her to achieve Trinity College London Grade 8 in bassoon in 2015. Monica also enjoys playing the piano, guitar and singing, however the bassoon is her main passion. 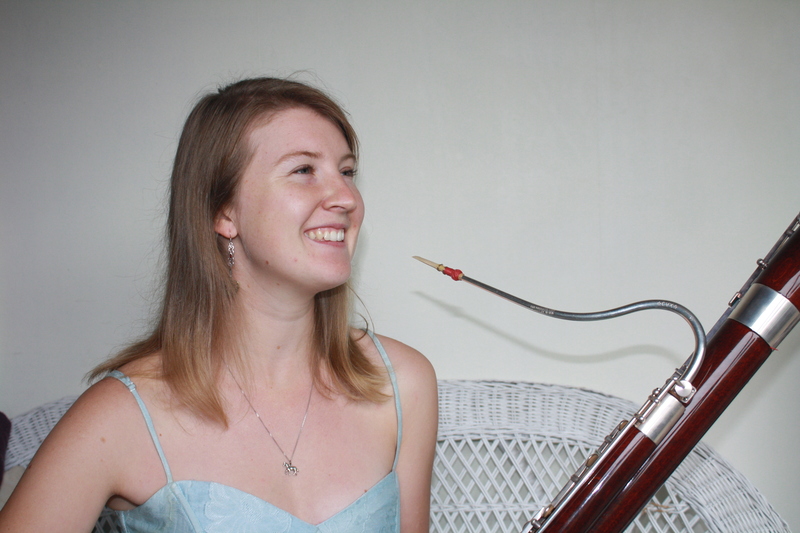 Charlotte is studying a Bachelor of Music/Bachelor of Science conjoint at the University of Auckland, majoring in Classical Bassoon Performance and Geography. She has played with AYO for three years. 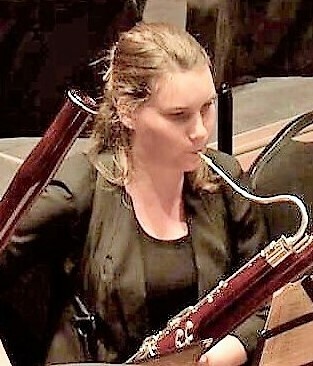 She has also played with many other groups, including the University of Auckland Symphony Orchestra, Manukau Symphony Orchestra, New Zealand Youth Symphonic Winds and the Trust Waikato Symphony Orchestra. Charlotte also plays the Contrabassoon and Scottish Fiddle, and her greatest music experience so far was spending the month of August 2016 playing in the Royal Edinburgh Military Tattoo with the Hjaltibonhoga Shetland Fiddlers. Henry is currently a student at the University of Auckland in his second year of study, pursuing a Bachelor of Music and Bachelor of Commerce conjoint, learning from Nicola Baker. He was introduced to the horn midway throughout 2013, having previously been a viola player for a number of years, and quickly took to the instrument, achieving his ABRSM Grade 8 in 2017. 2019 marks Henry’s third year playing with AYO, having been a member of the touring orchestra last year. Further ensemble experience includes playing with the NZSO National Youth Orchestra last year, and being Principal Horn of the NZ Secondary Schools Symphony Orchestra in 2016. 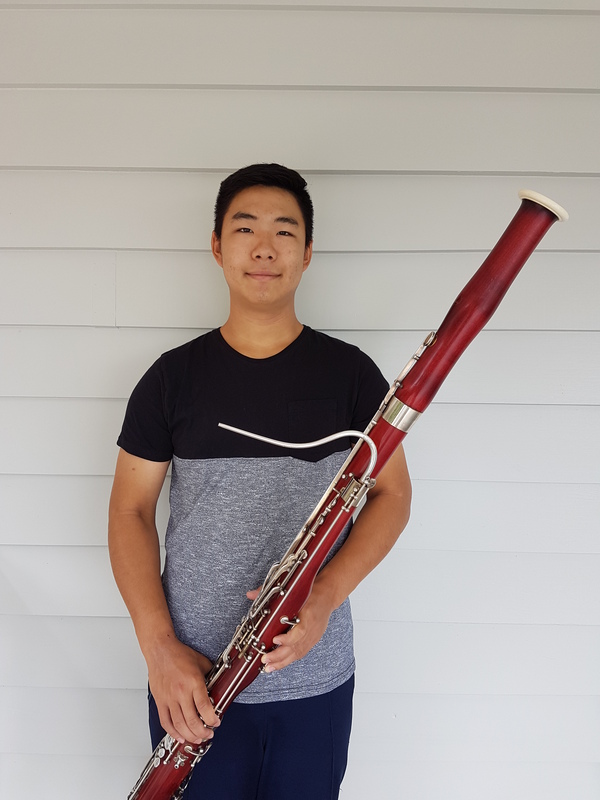 He has played as a soloist with the Westlake Chamber Orchestra in 2017, and last year took part in the Gisborne International Music Competition. 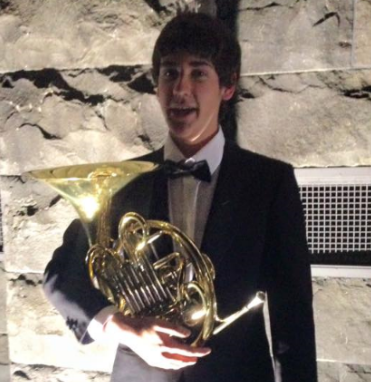 Max is an 18 year old student who is attending University of Auckland this year for a french horn performance degree. He has been playing the horn for round about 8 years now and has achieved grade 8 with Merit. Max is also involved with the New Zealand Youth Symphonic Winds this year. Looking to the future, he wishes to improve his skills and eventually become a professional horn player. Evan Metcalfe is 15 years old and in Year 11 at Saint Kentigern College. 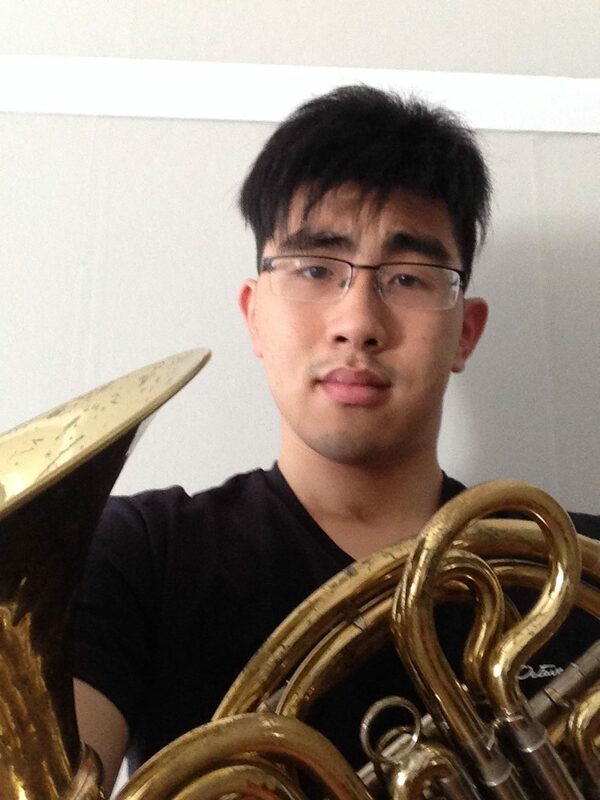 He has been playing French Horn for 7 years, has achieved Trinity Grade 8 and has been a member of the AYO for 4 years. Last year he successfully auditioned for a place in the NZSSSO and achieved a place on the NZSO National Mentoring Programme. 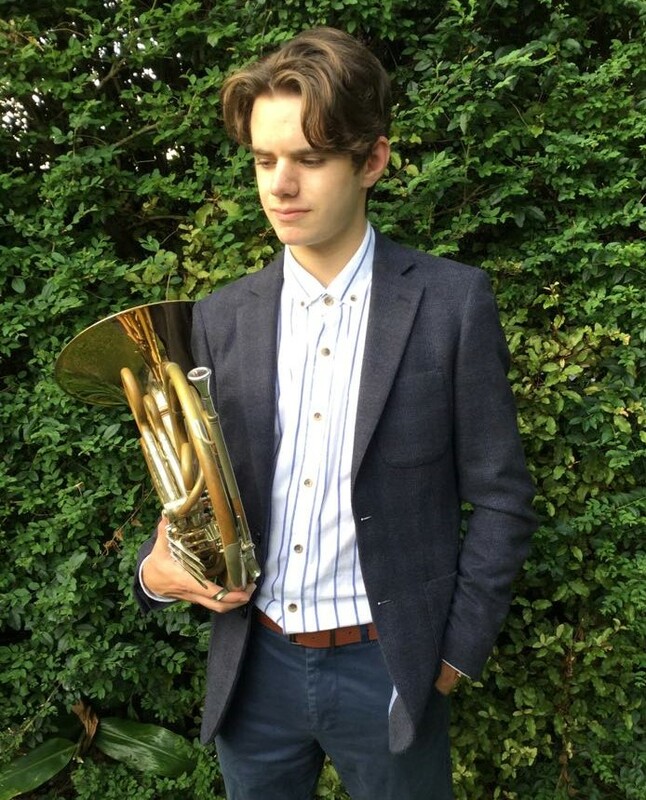 In 2019 he is working towards completing a musical Diploma, as well as being involved in many school music groups as the principal French Horn player. 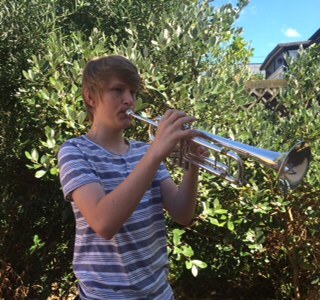 Sean has been an amateur horn player for 5 years and this is his third year in the Auckland Youth Orchestra. Having started in high school, Sean picked up the instrument rather quickly and has played in various ensembles throughout New Zealand such as the ASO and NYO. Sean is currently in his second year of studying for a law degree and hopes to continue being involved in various music groups and events. 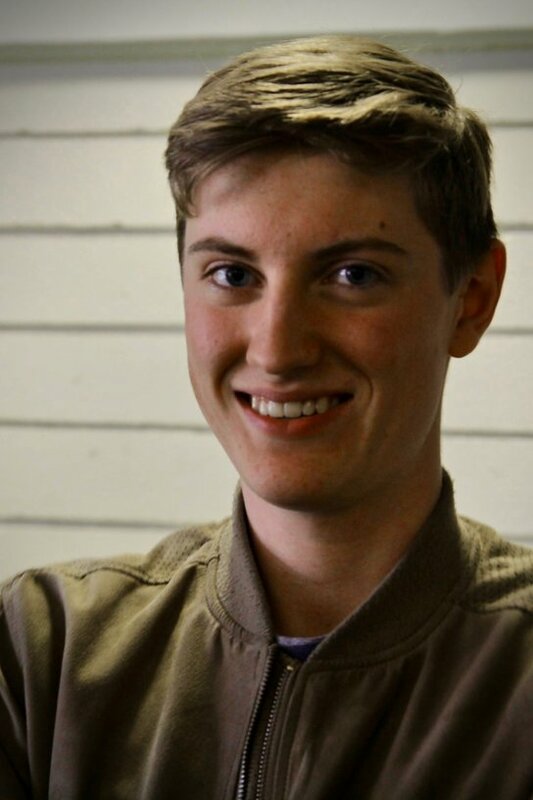 Jake is in his fourth year at the University of Auckland, pursuing a conjoint degree in classical trumpet performance and computer science. Jake’s interest in music began at the age of four, when his preschool teacher introduced him to the trumpet. Since then he has been involved in many musical groups both at university and in the wider community. He earned his ABRSM music performance diploma in trumpet in 2014, and his trombone performance diploma the year after. In 2016, Jake played trumpet, cornet and flugelhorn in the Auckland Theatre Company’s production of Billy Elliot the Musical, and also performed with Josh Groban at Vector Arena as a featured trumpet soloist. More recently, Jake played trumpet in the 3rd and 4th seasons of shows at Auckland’s Pop-up Globe. He also performed the Haydn Trumpet Concerto with AYO in 2018 as part of their tour to Europe. Benjamin Webster is 17 years old and is in year 13 at Westlake Boys. He has played the trumpet for 8 years and his current teacher is Huw Dann, the principal trumpet of the APO. Benjamin has been a member of AYO since 2015 and is section leader in Westlake Boys’ High School’s premier Concert Band and Symphony Orchestra. In 2016 he played lead trumpet in “Synq” brass quintet, making it into the Regional Finals of the NZ Secondary Schools Chamber Competition. He he has played in many other ensembles including the 2015-2016 NZ Youth Brass Ensemble, APPA Festival Orchestra, APO Summer School Orchestra, NSYO, AYSO and NSYWSB. Benjamin is also a scholarship recipient for the National Pettman Junior Academy for 2016 and 2017. He hopes to become a professional trumpet player by continuing his studies at university after high school. Sang Hyun is in his second year of his conjoint degree studying classical performance on trumpet, mathematics, and chemistry. He has played trumpet since primary school and has been involved in various musical and cultural groups throughout school, university and in the community and hopes to get the most out of AYO. Some of the ensembles Sang Hyun has previously played with include Auckland City Brass Band and Westcity Concert Band. Music brings him wonder and he appreciates the joy it brings to so many people! He is excited to be part of AYO in 2019 and to gain more orchestral and ensemble experience throughout the year. Amy is a Year 12 student at Baradene College, and this is her first year in AYO. Amy started playing the trombone at 8 years old and achieved her grade 8 in 2018. 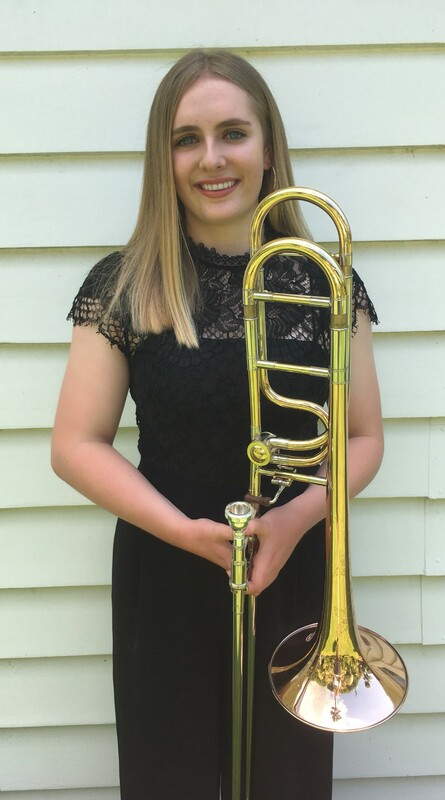 Since starting the trombone, Amy has played in APPA concert band and festival orchestra, KBB Honours, Auckland Secondary Schools Big Band, New Zealand Youth Symphonic Winds as well as being first trombone in the Baradene and St Peters Orchestra and Baradene Concert Band. Amy has been Baradene College’s brass musician of the year since 2017 and won the Cosgrove Cup for senior jazz in 2018. Amy is excited to be in AYO and is looking forward to playing the varied and challenging orchestral programme. Alexander is a Year 11 student at Selwyn College and this is his first year with AYO. 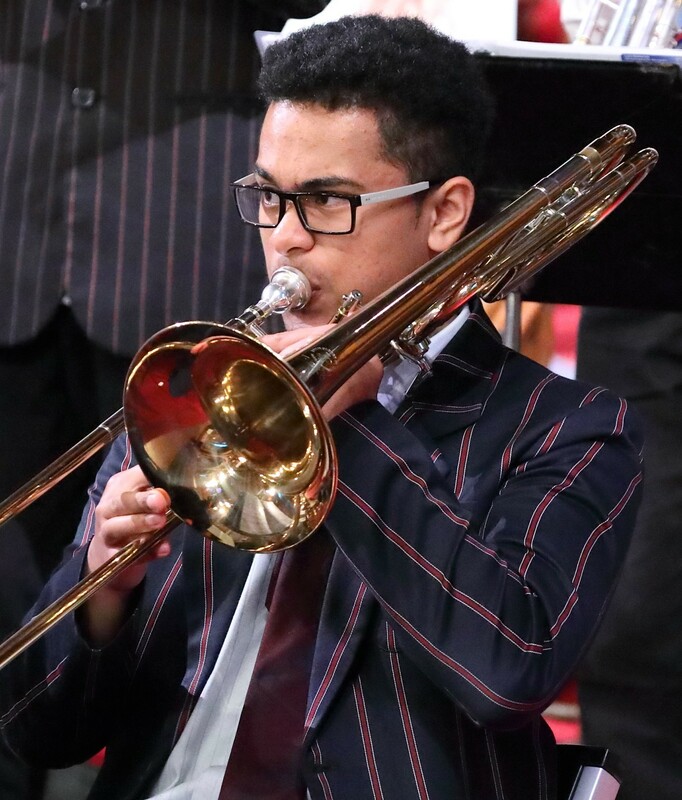 Beginning to play trombone in Year 8, he has acquired knowledge from tutors at school and at the APO Young Achievers programme, played at the KBB Music festival twice (Selwyn Jazz band) and played in the Senior Production band at Selwyn College for the past 2 years. He also attended the Trombone Aucktet day in 2016. In 2017 Alexander was awarded Top Scholar in Music for year 9 (2016) and year 10 (2017), as well as the Hamish Arthur Trophy for contribution to Junior Music at Selwyn College. In 2018 Alexander will further his formal trombone, piano and viola tuition and he looks forward to playing in the AYO. Tavite is 18 years old and has been playing the trombone for 8 years. He is currently learning from AYO alumnus Paul Cho. Apart from the AYO, he is involved in the Manukau Symphony Orchestra, Manukau Concert Band and New Zealand Youth Symphonic Winds. He is also an assistant at the Howick School of Music. Tavite’s aspirations for the future are to study classical trombone at the University of Auckland and eventually become a music teacher. 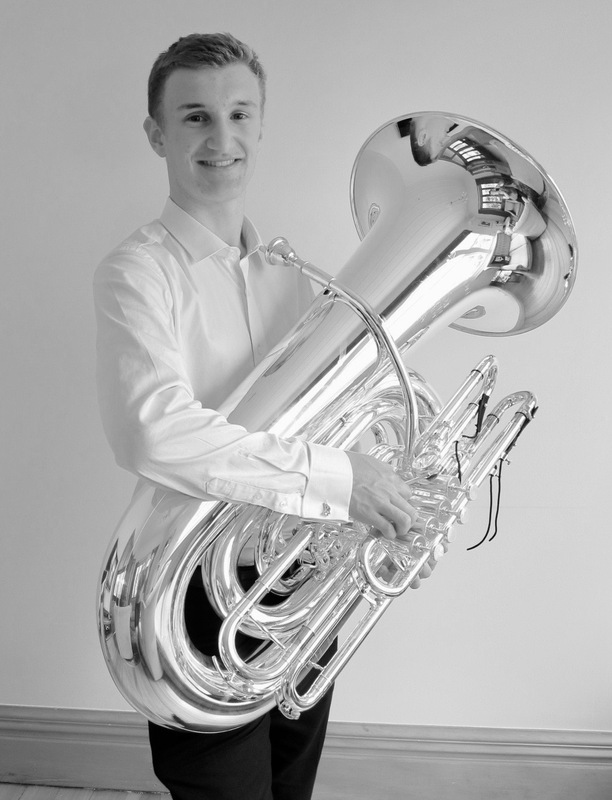 Lachlan began playing tuba in 2010 when he was just 10 and the instrument was almost the same size as he was! Seven years later he is now entering his final year at Auckland Grammar School, and he is planning to pursue music at university next year. Alongside the AYO, he is involved with music groups at school as well as several chamber groups outside of school. Tuba may seem like an odd choice, but to Lachlan, forming the foundation of the brass section and thus the whole orchestra, is an incomparable experience which he adores. If you attend AYO concerts this year, give some thought to the guy down the back – he probably waited 82 bars for that low note. Naomi is currently in her final year at Epsom Girls Grammar School, where she started Percussion at the beginning of 2016. She also actively plays Cello and Oboe which she began in 2015. Despite her number of years on her instruments, she is a part of her school’s Symphonic Orchestra, Concert Bands and ensembles on each respective instrument. 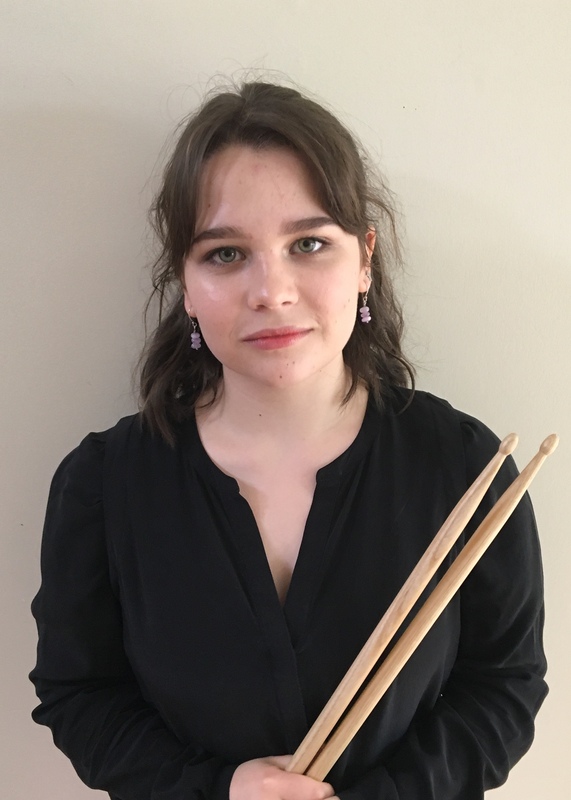 Last year she had the opportunity of playing in KBBMF’s Honours Orchestra percussion section, and early this year she was accepted into the APO Summer School where she received mentoring from APO percussionists & performed alongside them. This is her first year in AYO and she is very much looking forward to it.